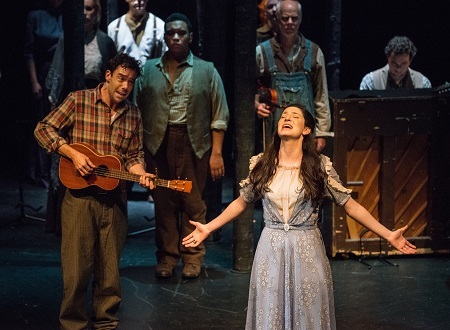 In Spoon River, Soulpepper brings together a cast of excellent actors, who are also accomplished musicians, to tell ghostly tales from a small town in a time gone by. The show is comprised mostly of songs, with some spoken pieces, and all the text is taken from the Spoon River Anthology of poetry by Edgar Lee Masters published in 1915. With a powerful score from Mike Ross and the inspired staging of Albert Schultz (the two also collaborated on the adaptation), the result is a gorgeous glimpse into the lives and deaths of people in rural America at the turn of the century. The show begins with an immersive experience as the audience wends their way through a hall decorated with old pictures and funeral trappings, including a casket with the “corpse” of a young woman. After picking a path through a haphazard, forested graveyard we found our way to the seating. When the performance begins we learn that the woman in the coffin was named Birdie and she’s being laid to rest upon the hill that is the graveyard of the town of Spoon River – a place that is, perhaps, haunted by musical ghosts. The scrim pulls up to reveal a stage full of people – with a cast of nineteen, it is easy to believe that there’s a whole small town up there. These are, however, not the living but the dead. Each actor plays a number of characters and many also play instruments, while everyone sings. There are two instances of scenes done in drag that threw me out of the show a bit, particularly because of the choice of performers for those scenes. Other than that, these tiny, detailed portraits of people – their loves and betrayals, their alcoholism and adultery, their co-dependence and loneliness – were beautifully realized. I cried twice: once at a duet between a man and a woman, young lovers who grew old and died together, and again at the end when Birdie sang her goodbye to life. Other scenes that will stick in my memory include a woman with a fiddle who won’t tell us her secret, a man who sets fire to a court house, and a rousing ode to booze. In all three a ladder is used to fine effect, simulating train tracks for the first, a jail cell for the second, and the bar of a tavern in the last. Other than the ladder and Birdie’s coffin, the only movable elements in creating imagery were lighting and the placement of bodies, with the occasional fall of tiny “leaves” from above. This kept the effects simple, which seemed appropriate to the town and the time, but no less striking than I have come to expect from a Soulpepper production. Over the whole thing presides a huge harvest moon, and the back of the stage is peppered with the trees and headstones that the audience first encountered on our way in. Since the show is comprised of vignettes showing the former lives of disparate characters there is no through-line to the plot, but Shultz and Ross maintain tension by juxtaposing a variety of emotional circumstances. In the split second of a scene change Spoon River made my feelings switch from vindictive glee to disgusted pity, from despair to hand-clapping joy. There are a lot of dead people in the world. We are lucky to have a chance to hear from the ones in Spoon River. Loved this show ….. so many multi-talented performers, not to be missed!